Data recently released by Knight Frank outlined that the first half of 2018 saw commercial property investment in the UK total £6.89bn, surpassing previous expectations. These investor classes include private capital, global institutions and equity funds. There are indications that this trend will continue. Central London remains the centre of investor interest because of the capitals perceived market liquidity, transparency and stability. 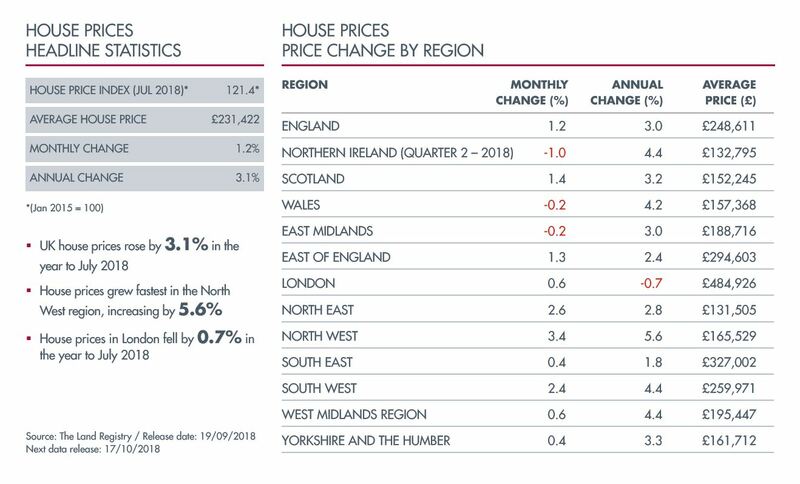 CBRE reveals in their quarterly Scotland Property Report that whilst Scottish commercial property returns fell slightly in Q2 2018, the office and industrial sector in this region hit 2.4% and 2.3% respectively, both of which were “significant improvements” over the first quarter of the year. Overall returns reached 1.4%, a slight decline from the 1.7% recorded in Q1. Not surprisingly, the weakest sector was retail, reporting returns of 0.3%, with CBRE commenting that this was “Reflecting the turbulence this sector has experienced so far this year.” The retail sector was also the only one to record a fall in capital values as well, down by 1.1%, as a result of a number of large high street retailers closing stores or seeking company voluntary arrangements (CVAs). The newly rebranded John Lewis Partnership (JLP) has agreed a deal with Peel Logistics and Rockspring to pre-let warehousing in Southampton, amounting to 46,353 sq. ft on a fifteen-year lease at £9 per sq. ft. They intend to start using the site by April 2019. This deal is part of JLP’s desire to create a new delivery hub in the area and to replace their existing facilities which are currently in the city centre. Savills have reported a 12.9% increase in domestic investors into the UK’s commercial property market. This home-grown investor group now accounts for 59% of all property purchases in the year to July. Given that non-domestic investment has seen a fall of 21% during the same period, the UK’s commercial property market has, therefore, seen a net investment of £18.8bn from domestic investors. This increased activity has been attributed to both the industrial and office sectors prime yields tightening by 75 basis points over the period in question.